Recently, we received an inquiry from a customer indirectly servicing the food industry. Their water is used for washing and must be clean and disinfected. They were looking for a disinfection method that would minimize their safety risk on site. 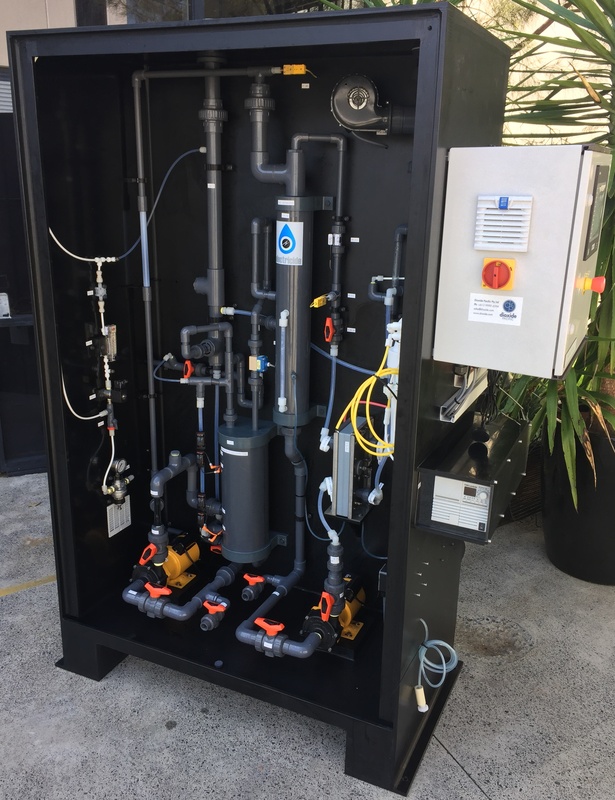 Filtration+UV was chosen as the primary method although they realized it would not be sufficient on it’s own as the reticulation pipework would require a chemical residual of either chlorine (hypochlorite) to prevent biofilm growth. Gas chlorine. Definitely not. Too dangerous. 12.5% sodium hypochlorite. Preferably not, as is Dangerous Good. Calcium hypochlorite. Not keen on handling tablets or granules. Electricide® HGB Hypochlorite generator using brine feed. Liked this option. Only handling non-hazardous brine and generating on site, low risk, dilute hypochlorite solution. What is the Electricide® HGB Hypochlorite Generator? 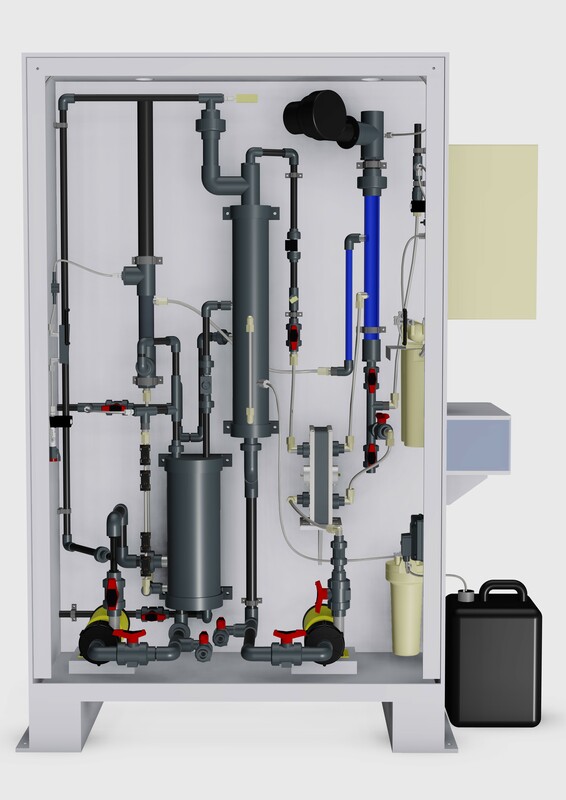 The Electricide® HGB chlorine generator is an electrochemical system for converting sodium chloride (salt) into chlorine. Electricide-B1 is a purified brine precursor that is fed into the HGB generator at the anode side of the electrolytic cell where chloride ion is oxidised to chlorine. Chlorine combines with the hydroxide formed at the cathode to make sodium hypochlorite solution at 5-25 g/L (as NaOCl). The generator is skid mount and easy to install on site. Electricide-B1 chemical is available ex stock from Dioxide Pacific. Chlorine reacts with caustic catholyte to form sodium hypochlorite and salt. Safety. Only one precursor chemical is required – Electricide-B1 and this is non-hazardous. The hypochlorite solution produced is 5-25 g/L at pH 9 – 9.5. This compares with commercial bleach at 12.5% (125 g/L) at pH 12. The lower concentration hypochlorite is much safer to handle and store. Stability. The lower concentration hypochlorite produced by the HGB generator is 25 times more stable in storage than commercial bleach. Longer life means lower cost. Purity. The hypochlorite solution produced by the HGB generator is extremely low in chlorate, sodium and chloride. This can be important for food production where low chlorate and perchlorate in the food product are important. Simplicity. The generator is simple to operate, install and maintain. Remote access. Web server access using any browser is standard with email alarms. Reliability. The generator membrane cell is guaranteed when Electricide-B1 is used as the precursor. The Electricide® HGB generators are available for purchase or rental. Rental can include maintenance. Electricide-B1 chemical is available in IBC’s (totes), 200L (55 gal) or 15L (5 gal) drums. Dioxide Pacific can install and commission the system if desired. Installation is a simple process for mechanical and electrical technicians.